No matter what the season, there is always something going on in the Village of Mt. Zion. Keeping our residents informed of scheduled events and local happenings is important. The Village of Mt. Zion is proud to help sponsor the Mt. Zion Community Garage Sale Friday & Saturday, April 26th and 27th, 2019. Advertisements, maps, and other announcements will be provided. To be included in the announcement literature, contact Village Hall at 217-864-5424 or return the form by Friday, April 19th, 2019. You must be a Village Resident to be included on the map. Forms can be found under the Parks & Recreation tab, picked up at Village Hall or by clicking HERE. 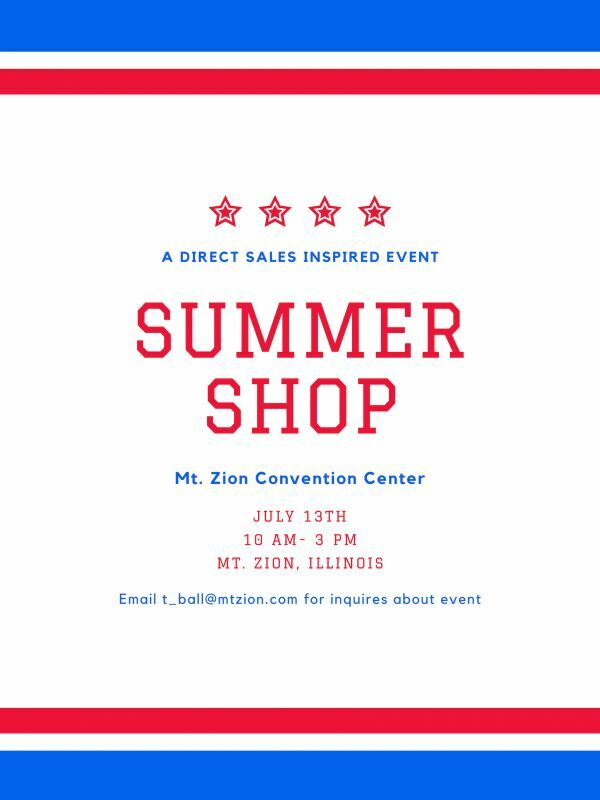 Summer Shop is a direct sales inspired event to be held at the Mt. Zion Convention Center. Visit all your favorite direct sellers in one location and shop until you drop. For more information contact Tiffany Ball at (217) 864-5424.